As the Wheel of the Year approaches Samhain and the days grow dark and the nights long, it becomes the time for scrying. This is not something that can be done in the brightness of a hot summer day. This is for the mystery of night and the dark. Even summer nights can be too alive with light for a good scrying session. But the cloudy darkness of October and November nights – the early fall of evening and the reluctant rise of the autumnal sun – makes for the best time to practice those arts that require the dark. Scrying, whether with a bowl of water or a crystal ball, is one of those arts. I must confess I have never scryed with a bowl of water or plate for the simple reason that I have never had the proper means to make one. I have dozens of bowls, many of them cherished antiques from my grandmother, but they are all pastel in color and totally unsuitable. My personal china is white with an apple design so that would not work either. And of course, I reasoned that someday the perfect bowl may present itself to me as I browse through some tiny shop not even looking for it. Because that’s exactly how it happens! But I do have a small crystal ball. I have been waiting for the summer months to end so I can use it. Being the kind of person who goes to bed early and gets up early, recently I have been able to have some very informative sessions with it. I wish I could tell you that I see visions in it like Auntie Em calling for Dorothy in “The Wizard of Oz”. It’s not like that. Is anything ever like it is in the movies? The light of the candle or candles, depending on your ritual, will help you see the images. Often the images will change as you sit and meditate or chant or sing. I usually see three or four. They have ranged from the ocean breaking on a beach to a crown of stars to a grinning jack-o’-lantern. They don’t come right away. Generally I have to sit for a while. Like anything, the waiting is the hardest part. You can buy crystal balls online; just Google “crystal ball” and there’ll be eight or more selections to choose before you even start looking! Mine was a gift and I love it more every time I use it. As the days get shorter and darker, I know I will be using it more and more. Blessings to all! 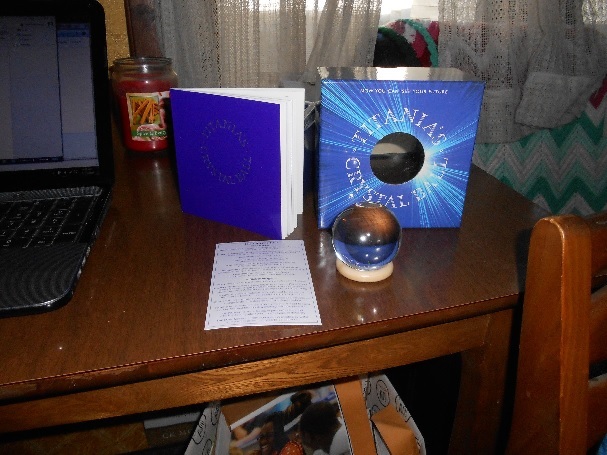 Our esteemed editor, Jennifer Wright, sent me a crystal ball to examine and review for Pagan Pages. It arrived within days of my birthday, which was just fabulous! It came in a royal blue box entitled “Titania’s Crystal Ball” and along the side of the box was written: “NOW YOU CAN ‘SEE’ YOUR FUTURE”. Inside the box was the crystal ball in a plastic cup to keep it from rolling around inside the box; a ring to place the ball upon when in use; a booklet to teach you how to use the crystal ball; a card entitled “The Image Key” with the most basic scenes you might see within the ball while in use; and a fold-up paper “table cloth” to set everything on. Everything in a lovely shade of royal blue which almost looks purple in some lights. If you don’t know anything about crystal balls and I am certainly one of those people, you would think that a crystal ball is large, like the one in “The Wizard of Oz” that the Wicked Witch of the West uses so effectively. I am sure large crystal balls like that can be found in occult stores and on the internet. But this one is much smaller. It fits quite snugly in the palm of my hand. It is maybe the size of a billiard ball, perhaps a bit larger. It is marvelously cool and smooth. The morning light shines through it onto the skin of my fingers. It promises secrets. It promises poetry. Titania Hardie, whom the bottom of the box says is a “third generation White Witch and best-selling author” recommends washing the crystal ball in a “mild solution of triple-milled rose soap and warm water.” (Hardie, 26) Of course, I didn’t have rose soap, triple-milled or any other kind but since she says that “you may prefer to follow the tradition of using vinegar and water” (Hardie, 27), this is what I did, since I always have a variety of vinegars on hand. I washed it carefully in a solution of white vinegar and water, asking it to be my friend and help me learn what I wanted to learn. Then I gently wiped it clean with a soft cloth. However, just this morning, I read in Tasha Fenton’s The Fortune-Teller’s Workbook an interview with a clairvoyant named Barbara Ellen who says the “first thing you must do is immerse it for 12 hours in salt water. Some Readers use a solution of vinegar and water. Wash the crystal under running water, ideally from some natural source, such as a waterfall or stream.” (Fenton, 58) If you don’t have a stream nearby, she says to collect rainwater. So with that in mind, I have some prep work before I can start to use my new crystal ball. 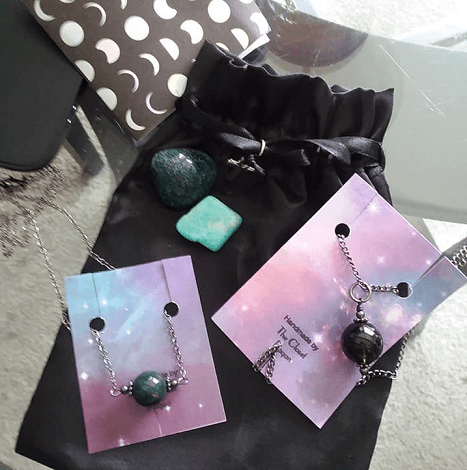 And I plan to read more about divination using crystal balls; there are numerous websites dedicated to the subject. So stayed tuned; I’ll be back with my report of what I am able to see in this lovely round crystal!